I am working with SharePoint 2013. 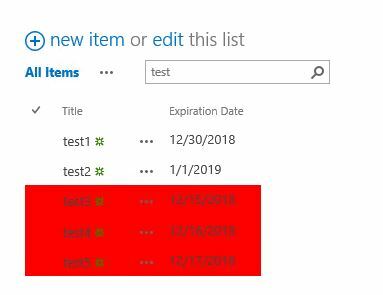 In one of the lists, I have a date column called "Contract Expiration Date" (Internal name: ContractExpirationDate) which contains a date value. what I want do is may be by adding some JS, I want to highlight the row in red if the date is in past (less than today's date) and if a user comes in and update the date value to show it in future then the row should no longer be remain highlighted. Can someone please suggest a JS solution that works. Thanks. We can use the following JSLINK code to achieve it, add the code below into script editor web part in the list view. Not the answer you're looking for? Browse other questions tagged list list-view jslink or ask your own question.